Altavia Anniversary is a two day event this year. 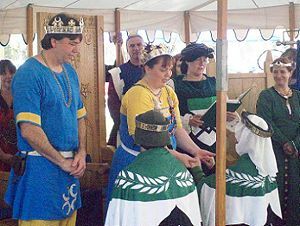 Secca and Meliora invested as the new Baron and Baroness of Altavia. The White Scarves of Caid launched the first Iron Crescent challenge. Mother's Day Brunch and 10-person Melees on Sunday! Come join us as we celebrate “Banner Days” in Altavia: This will be a two day non-camping event -- Tourneys and Anniversary events on Saturday -- Mother's Day Brunch and 10-person Melees on Sunday! Saturday, May 9th, will be a day of Pageantry as we raise our pennants high! Join us in the morning for the Investiture of our Sixth Baron and Baroness. Then, standard double elimination tournaments will determine Altavia's Armored, Youth Combat and Rapier Champions. Bring your flags, your banners, your heraldic devices, large and small -- and raise them to the skies. We will have banner stands for all fighters to place therein a banner or flag, so please bring your colors upon on a staff 3 to 6 foot tall. Our Arts & Sciences Champion will be selected from the most spectacular Banner and/or best use of your device or other heraldry on an item (including clothing). There will be a pennant making class for the youth, and a Parade of the day’s Champions led by the Youth into Closing Court. A Bardic competition to find the next Bard of Altavia will be held on the theme of "Pageantry." Present a poem, song, story, juggling act, etc. that involves Pomp, Pageantry, and/or Tournaments in some way. All through the day a Chess Tournament will determine Altavia’s Chess Champion. Sunday May 10th, there will be a 10-fighter per team Melee tourney, either round robin, or double elimination (depending on how many teams assemble). Just in time to get your fighting units ready for Potrero War! These Melees will be for both Armored and Rapier teams, who will be fighting for the honor of a Mother present that day. Also in honor of Mother’s Day, there will be a Brunch offered for a donation, with all Moms present eating for free! Bring your Mother since this is HER day! 11:00am Mothers’ Day Brunch and beginning of the Brawl Melees! Merchants are welcome both days! Veteran's Park requires 10% of gross profits fee. Inquiries please e-mail the Autocrat. When Laertes and Bridget stepped down as Baron and Baroness of Altavia we raffled off the opportunity to "kill" then during their stepping down court. Courtney of the White Meadow won the right to help Laertes depart his throne -- she had his rapier "peeps" stone him with yellow peeps. I won the right to bring Bridget Death by Chocolate -- so my household, House Zacharia, helped Bridget shuffle off the mortal coil with a presentation of fudge. This page was last modified on 4 May 2010, at 11:56.